The Dharma of number 11 is 10 + 1 = 11. To exist in and through the grace of the non-existence. It is the highest expression of instinctive and innate spiritual wisdom. The Karma of number 11 is 1 + 1 = 2. It is to be the duality. To be ever critical. To exist through denial of existence. It is the extreme expression of spiritual naivety. 11 is 10 + 1. The courage to be humble and the humility to be courageous. Returning to rest in self. Listening to your existence you are never alone. There is always the listener and the sound of one’s self. You are in good company. Every journey is a circle. The year comes closer to the end, the journey takes you back to the start. The pilgrimage of the year is over. And bears its fruits. Like a prophecy fulfilled. It is time to share the harvest, (thanks giving). The 1 has created the illusion of the small individual self to provide the possibility of an actual self. a unit of consciousness that can consciously relate to the totality of consciousness. So 11 is the mirror effect of the universal spirit. It is consciousness being conscious of itself. 10 is the totality but it is also the ultimate zero; a gateway through which all temporary existence originated and so also returns to the never ending formless and nameless background. To know the zero is to know the essence of your 1. Knowing your 1 you will know the 10. 10 is sum of the parts. As 1 you are part of the Sum. 1 is the small which contains all (10). The whole self is replicated in the ears, eyes, hands and feet. Down to every cell and particle. Being 1 can seem very lonely but there is nothing more alone and singular than the 1 unit sum of totality. So being 1 is one of the ways to get to know the absolute 1 through the micro-version of 1. When we refer to, speak of, or otherwise remember, the true and immeasurable vast 1, the sum of all that was before, is during and continues after all manifestation, then we live. Our own small 1 is actually brought into focus. Gurprasaad: 11 is an expression of the individualised soul having passed through the zero state and now living the mutual and parallel state of relation in mutuality. As if to say ‘Oh God, this light that i and others have called myself is in fact all yours.’ Gurprasaad means to discover the light that was always the case, and to discover it within ourself. Like a hidden light that was always there in the dark. it was the Self that was illuminating the search for the self. Gurprasaad also reminds us that we do not reach the realisation of truth only by our own efforts. There has been a guiding stimulus in our life which has been turning the wheels of the cosmos. As the 1 beside the 0 is the master’s stick that prods, pokes and taps upon our small life, steering us towards our final destiny. In the Sikh tradition the 11th Guru is the scripture known as the Sri Guru Granth Sahib. It constantly echoes the inner truth in us and guides us back to our original nature. Its words provide the road map and serve to clear the fog of confusion and ignorance. Each page a mirror to another facet of our infinite constitution. – reflect on the significance of this statement: God and me, me and God, are one. – Return to the simple. To the basic facts, which are not many. ‘I am, You are, We are, We are 1’. – The theme is alignment with the 1. It is our original condition. – Apply yourself to experience solidarity, common solitude, the feeling of being shoulder to shoulder, with all humanity. Shiv Charan Singh is the founding director of the Karam Kriya School and Kriya centre for Kundalini yoga in North London. 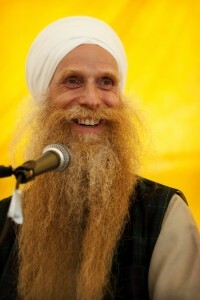 Scottish by birth, he is an outstanding and authentic spiritual teacher. Karam Kriya means ‘action in spiritual awareness’. Shiv Charan is deeply committed to guiding students in their spiritual growth so they can bring spiritual awareness into their everyday lives and develop their full potential as human beings. He is a skilled counsellor, author of several books on human communication, the mystery of numbers and poetry. He runs training programmes throughout Europe, Russia and the Lebanon. For more information on Karam Kriya & Shiv Charan Singh please visit Karam Kriya UK, Karam Kriya Europe, or Quinta do Rajo.